The eye-catching packaging of the Zeppi`s Bajtra liqueur. An increasingly popular liqueur, made from prickly pears and called after it in Maltese - Zeppi's Bajtra - owes its origin to the late Madalien Camilleri who used to run a coffee shop in St Lucy Street, Naxxar. Madalien used to sell wine by the bottle but her reputation was based on an excellent homemade anisette. Her son Joseph, the founder of Master Wine, took up winemaking at the age of 15. He passed on his skills to his sons who have applied modern technology to traditional family recipes to produce wines and liqueurs that are more than keeping their own with foreign competition. One of these liqueurs is Zeppi's Bajtra, produced by Madalien Ltd, a subsidiary of Master Wine Holdings. Prickly pear cactus is grown by farmers to serve as a wind breaker and bar access to their fields. They feed the cladoes, the stem of the plant, to ruminants because of their fibre content. Silvio Camilleri, managing director, said the idea of producing a liqueur from the fruit of the prickly pear cactus had been fomenting in his mind for a long time. The procedure to extract the ingredients from the plant to turn it into a liqueur is quite complicated. However, the fermentation process is similar to that of winemaking. Prickly pears are harvested mainly in August. A similar liqueur is produced in other countries but Mr Camilleri believes the Maltese product is superior. "I have tasted prickly pears grown in other parts of the world but the taste is not as pleasant as the Maltese product's. "This is probably due to our terrain and climate. The tastier the fruit, the tastier the resultant liqueur," he said. Zeppi's Bajtra liqueur should be served chilled. No ice should be added to it. The bottle should, instead, be iced. On its own, the liqueur lends itself as a delightful aperitif, as well as an invigorating after-dinner drink. Among the tastier long drinks that can be made are Zeppi's Bajtra liqueur, with Chardonnay and lemonade. Zeppi's Bajtra liqueur was launched last August and sales took off with the demand going beyond the expectations of its producers. "We regularly get e-mails from customers asking where they can get Zeppi's Bajtra liqueur outside Malta, and whether we can forward orders to them by post," Louie Camilleri, general manager of Madalien Ltd, said. Zeppi's range includes anisette and honey liqueur, both produced from natural ingredients. 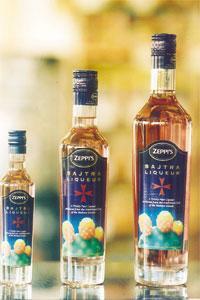 Zeppi's Bajtra liqueur is certified by the Malta Crafts Council as an authentic Maltese product. The company has exhibited its products in international fairs including in Paris. "We have had excellent feedback from these fairs and we are already processing orders. We will be taking part in specialised fairs where buyers look for hand-crafted goods, and in other international fairs such as the one in Anuga, Germany, which is the biggest food and drink fair in Europe." Madalien Ltd is geared to meet increasing consumer demand in niche markets. Having identified its strength and weaknesses, the company embarked on a restructuring process, aiming to increase its presence in targeted markets with its portfolio of liqueurs. A lot of time and effort has gone into the packaging of Zeppi's range, making it a high-end market product. The artistically striking packaging provides the range with a clear cut competitive edge. "Our motto is 'quality before quantity'," Mr Camilleri stressed. Although prickly pear cactus is thought to have originated in the tropical Americas, it is native to semi arid parts of the US, Mexico and South America. It also flourishes in the Mediterranean, Africa and Australia. Cactus pear pulp consists of 85 per cent water, 15 per cent carbohydrates, Vitamin C, glucose and fructose. It is very high in fibre and low in calories.